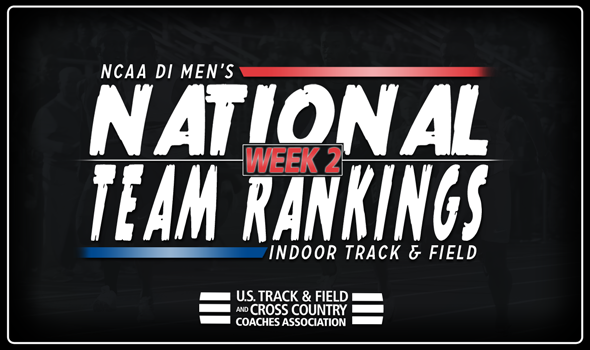 NEW ORLEANS – Four teams jumped into the top-10 of the NCAA Division I Men’s Indoor Track & Field National Team Computer Rankings. Oregon, Penn State, BYU and Southern California all climbed higher in the most recent rankings that were released Monday by the U.S. Track & Field and Cross Country Coaches Association (USTFCCCA). Nothing changed to the top-3 as Florida, Georgia and Texas A&M still occupy those spots. The Gators lost a little bit of ground, but still hold a near 100-point lead over the Bulldogs. Further down, strong efforts in the distance medley relay propelled the Ducks, Nittany Lions and Cougars. Oregon comes in at No. 4 this week after its effort at the Dr. Sadler Invitational. The Ducks now have the top-ranked DMR team in the nation after Blake Haney, Cameron Stone, Mick Stanovsek and Sam Prakel got the baton around in 9:31.87. Penn State went from No. 18 to No. 8 – its best ranking since 2015 – following the Penn State National this past weekend. The Nittany Lions’ quartet of Isaiah Harris, Dan Chisena, Domenic Perretta and Colin Abert laid waste to the field – winning by nearly 18 seconds – and recorded the third fastest time in the nation this year (9:36.48). BYU hasn’t been ranked in the top-10 since 2012, but times are a changing. The Cougars finished runner-up to Oregon in the DMR at the Dr. Sadler Invitational and clawed their way up from No. 19 to No. 9 in the rankings. The Trojans are back in the top-10 again, a place they occupied in the preseason (fourth). Southern California saw Eric Sloan notch a mark of 16.33m (53-7) in the triple jump and move up to second nationally and sixth in the USTFCCCA Event Rankings. Three other teams turned in multiple-spot jumps: Georgetown, Florida State and Auburn. The Hoyas went from No. 27 to No. 18. The Seminoles traveled from No. 23 to No. 19. And the Tigers have improved 10 spots from Week 1 and come in at No. 21 this week. This is the first time since 2015 that the Hoyas and Seminoles have been ranked in the top-20 and a small move would put Auburn in that group for the first time since 2013. The 2018 NCAA Division I Indoor Track & Field Championships will be here before you know it. Be sure to check back each week as these rankings are bound to shift ahead of March 9-10 in College Station, Texas.